I participated in Influencer Activation on behalf of Mom Central for Cricket Wireless. I received a promotional item to thank me for participating. I love going to see my favorite bands perform live, there's nothing like hearing your favorite song begin to play, right in front of you, for the very first time ever. It's a thrilling experience to say the least and my favorite concert memory involves one of my absolute favorite bands, My Morning Jacket. MMJ performed at the Americanrama Fest, which wasn't really a festival but a small bundle of bands playing that included some other awesome performances by Wilco, Bob Weir, and Bob Dylan. My Morning Jacket's performance was unbelivable. It had just started raining, there was electricty in the air from the lightening crashing all around the ampitheater, and then "Circuital" started to play and it sounded clearer and more vivid than I have ever heard it... Sometimes when I hear bands play I'm disappointed because they sound nothing like their recordings, My Morning Jacket was the opposite of this: they sound better live, if that's even possible. Cricket Wireless aims to give people something to smile about (hence, their #STSA campaign). They recently gave several people Something To Smile About by sponsoring The Pitbull and Enrique Iglesias tour... but they are more than a sponsor, Cricket is enhancing the concert experience! The "Cricket Stage" will be present at this concert, this is a 10x20 stage where fans can hop up and give their best rock star/model pose. Participants can share their images on their social channels via "share kiosks" around the stage. Photos shared will be entered into a sweepstakes where a winner and 3 guests will get a trip to the Miami Latin Grammy Street Party. Plus, all participants will receive a pair of ear buds! Not only will you have the chance to win an awesome trip, you can be part of the VIP meet and greet also sponsored by Cricket Wireless. Participants will get to meet Pitbull or Enrique and take photos on with a Cricket device. Selfie Stations will be set up on mirrors in the ladies rooms, encouraging all of us to get our selfies on - as if we needed an excuse! And lastly, if you want to score the perfect picture with Enrique and Pitbull, look for the Hologram Standee boards and pose with them for a picture that looks so real! 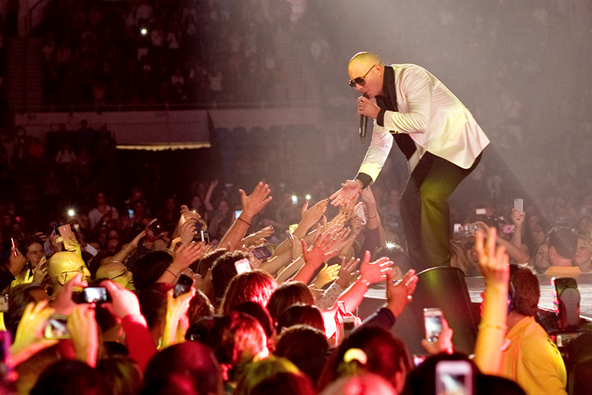 So if you love Pitbull and Enrique and want to have the most amazing time, check into getting your tickets today.